The DNA Engine Opticon 2 Real-Time Cycler PCR detection system uses a fixed array of LEDs for fluorescence excitation (470-505 nm) and two photomultiplier tubes for 2-color detection (523-543 nm 540-700 nm). 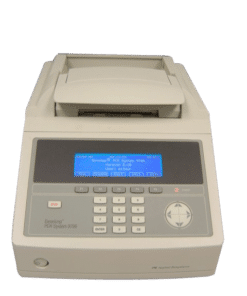 The DNA Engine Opticon 2 Real-Time Cycler system is built on an DNA Engine thermal cycler which includes a thermal gradient feature. 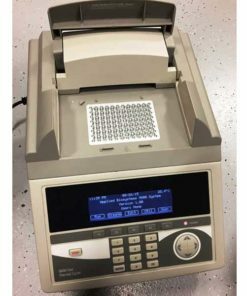 This item includes the thermal cycler 96-well sample block optical tower analysis software with melt curve computer and monitor. Complete system requires purchase of a DNA Engine chassis and an opticon-specific 96-well Alpha unit. Protocols are entered using a 5 x 7″ touch screen and with room for 60 protocols you’ll have plenty of memory. Like most BioRad instrumentation the software exceeds all your requirements & expectations is very intuitive therefore reaching for the manual will be a thing of the past!…..thank goodness! Real time PCR enables both detection and quantification (as absolute number of copies or relative amount when normalized to DNA input or additional normalizing genes) of a specific sequence in a DNA sample. The procedure follows the general principle of polymerase chain reaction; its key feature is that the amplified DNA is quantified as it accumulates in the reaction in real time after each amplification cycle. Multicolor capability allows detection of SYBR Green I and FAM in the first channel and a range of fluorophores in the second channel including TET HEX VIC and TAMRA for a multitude of applications such as RT-qPCR and allelic discrimination.